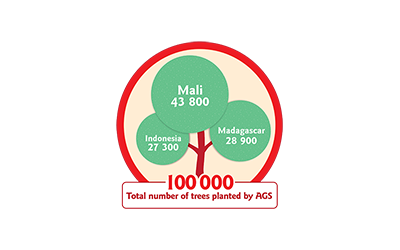 AGS is proud to announce that as of 2014, with the trust of our clients the group has planted 100 000 trees through AGS’ ‘One Move, One Tree’ campaign. Now in its sixth year, statistics prove that AGS’ execution of this campaign continues to strengthen each year. This is thanks to AGS’ loyal clients who placed their trust in us, warmly embracing ‘One Move, One Tree’, and enabling AGS’ network of 128 offices in 80 countries to give back to the environment and reduce its collective carbon footprint. 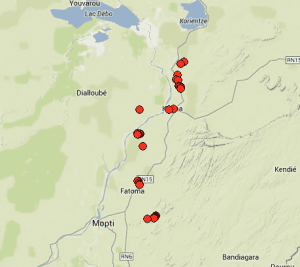 “Having personally spearheaded this project since its start in 2009, I am thrilled that we have surpassed the 100 000 benchmark,” says Gilles Taïeb, Executive Director for AGS. In 2009 AGS formally launched the campaign by partnering with Planète Urgence, an international Non-Governmental Organisation which supports projects involving the protection of the environment and the promotion of biodiversity. With each international move booked through AGS, regardless of volume, AGS has committed to donating to Planète Urgence for a tree to be planted. This contributes towards reforestation in three environmental focus areas – Mali, Indonesia and Madagascar – and a certificate confirming this fact is e-mailed to AGS’ clients. For more information on AGS’ environmental programmes, and to download and familiarise yourself with our detailed Environmental Policy document, please visit the Corporate Social Responsibility section of www.agsmovers.com. 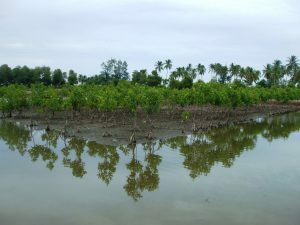 North Sumatra region of Indonesia: swamp trees such as these, planted through AGS’ partnership with Planète Urgence, have played a critical role in reconstructing the mangrove corridor and combatting global warming.